My circumstances have changed and I can no longer keep my Airedale. Can ATRA help me? Yes. Our mission is to find is to find forever homes for dogs such as yours. What will happen to my dog after I surrender him/her to ATRA? The dog will be given a thorough health check, receive any necessary immunizations, and will be spayed or neutered if that has not already been done. Then the dog usually is placed in a foster home so we can see what sort of home will be right for this individual dog. Occasionally, if a dog needs some obedience training, he/she will be placed in a six-week training program. If the dog has serious health problems that can be fixed, ATRA will pay for the necessary treatment. If the dog has not been groomed, we will get him/her groomed. Once all of this is done, ATRA will place the dog on a trial basis in an adoptive home. If the placement is a good one (and most of our placements work out great), the new owner will permanently adopt the dog after a few weeks. How do I know my dog will be going to a good home? ATRA screens prospective adoptive families VERY carefully. An application for adoption must first be submitted to us. The form collects a wide range of information about the type of situation the dog will be in, who the family members are, what their home and yard is like, what other pets the family has, and what their expectations are of their new dog. When we receive the application, we do a telephone visit with the family and then schedule a home visit. We always take along one of our own Airedales on the home visit to see how the family interacts with the dog. We also check vet references to make sure that current pets are well cared for. 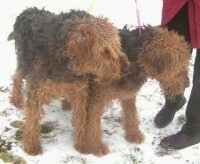 We give preference to people with previous Airedale experience and also to people with fenced yards. We work hard to match dogs with appropriate households and we do extensive follow-up. If a placement is not working out for any reason, we take the dog back and find another home. What exactly does it mean when I sign the rescue release form? It means that you are surrendering the dog to ATRA and giving up any ownership rights you have in the dog. Once you have signed the form, you do not have any right to try and take the Airedale back. So think carefully about what you are signing. Generally, no. We have learned through the years that it is easier on the dog and the new family if there is no contact between the previous owners and the adoptive owners. However, you are encouraged to write notes about anything you want the new owners to know and we will pass on these notes on. The new owner can learn from your experiences with the dog. Will you pay me anything for my dog? No. ATRA is a non-profit organization that does not have the funds to pay for dogs. Our funds are needed instead for the extensive health checks, spaying, transportation, and other support services for the Airedales we rescue. On occasion we pay several thousand dollars for surgery to correct a health problem such as hip dysplasia. On average, we invest more than $400 in each dog that we rescue. I have a mixed breed, part Airedale and part something else. Will ATRA take him/her? No. Because our resources are limited, ATRA can only accept purebred Airedales. However, we have a page on our Web site to showcase mixed breeds. As a service to you, we can put a description on this page free of charge to help you get the word out that you need to place your dog. Who do I contact to surrender my Airedale? Go to the Contact Us tab and contact any of the people listed for your state. They will be happy to help you. You will need to complete the "ATRA Surrender Form" below and complete it. Click on the "Surrender Pamphlet" below to get a pdf file of the discussion above on questions about surrendering an Airedale in a tri-fold format.